DESIGN CONCEPT:Generally, people just need to fully charge their phones once in a day. OISLE\'s design conception is to find a perfect balance between practicability and exquisiteness, and with the best quality. QUICKER CHARGE & INCREDIBLY SLIM:Press to start normal charge, holding 3 seconds to start QUICKER charge. The iPhone MP282 backup battery doubles your iPhone capacity with adding only 0.28 in thickness and 0.12 lb. SMART LED BATTERY LEVEL INDICATOR: No need to use/buy additional Micro USB cables. You can use your existing lightning cables to charge the battery case and your iPhone simultaneously. 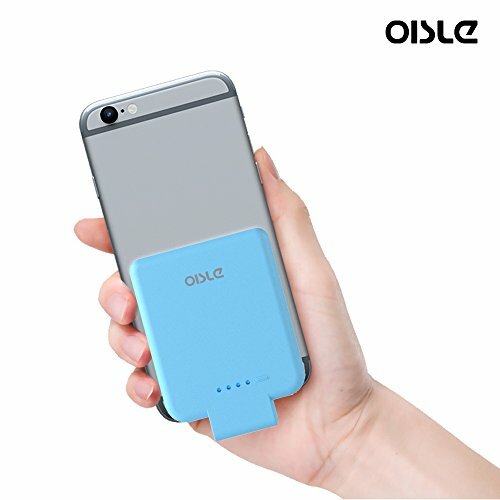 COMPATIBILITY: No need to change your battery case when you change new iPhone.100% compatible with iPhone 7/ 6 / 6s /5s / 5. 100% SATISFACTION GUARANTEED: If you\'re not completely satisfied with your purchase, please simply let us know and You\'ll be Offered a FULL Refund or Replacement.